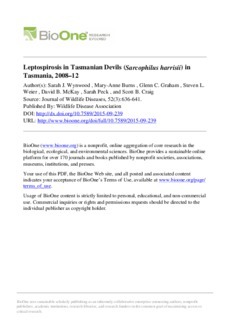 In 2014, we performed a diagnostic study of leptospirosis in Tasmanian devil (Sarcophilus harrisii) samples collected between 2008 and 2012 from wild and captive animals. Tasmanian devil populations have been declining because of a facial tumor disease since the 1990s, with ongoing investigations examining potential causative agents. Identifying other causative pathogens that may contribute additively to their decline is important to preserve current and future populations. We tested 81 Tasmanian devil serum samples and two tissue samples using PCR, microscopic agglutination test (MAT), and microsphere immunoassay (MIA). We found evidence of leptospirosis in Tasmanian devil populations across a wide geographic range of Tasmania. Antibodies to serovars in the serogroup Javanica, which are not considered endemic to Australia, were identified in 10 Tasmanian devils using MAT. We also identified serovar Celledoni serologically using the immunoglobulin G MIA and detected Leptospira in one sample using PCR.